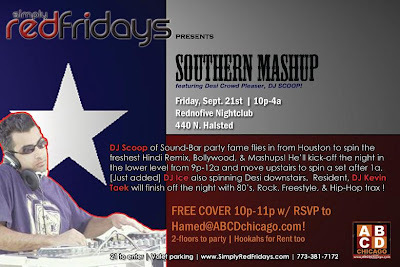 ABCDchicago: DJ Scoop & DJ Ice at Redno Friday! DJ Scoop & DJ Ice at Redno Friday! feat. Desi Crowd Pleaser, Houston's DJ Scoop! DJ Scoop of Sound-Bar party fame flies in from Houston to spin the freshest Hindi Remix, Bollywood, & Mashups! He’ll kick-off the night in the lower level from 10p-12a and move upstairs to spin a set after 1a. [Just added] DJ Ice also spinning Desi downstairs. Resident, DJ Kevin Taek will finish off the night with 80’s, Rock, Freestyle, & Hip-Hop trax ! ** FREE COVER 10p-11p w/ RSVP to Hamed@ABCDchicago.com!